We came ... we shopped ... we're ready for cocktails, proclaim these fashionable ladies on a downtown spree. Juice glasses may be the epitome of midcentury respectability—but who says you can't slip a little nip of something stronger in there? 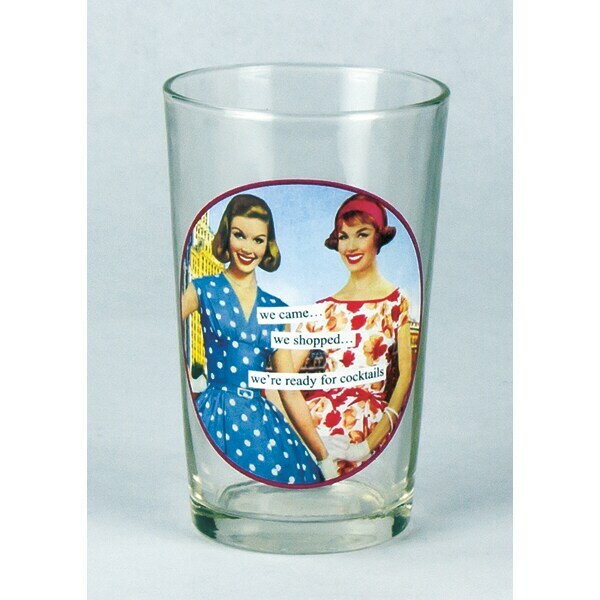 Decorated with Anne Taintor's distinctive style of 1950s advertising art paired with sly captions, this set of six 6-ounce glasses is ready to liven up your next brunch or girls' night in. Because the decoration is a colorful decal, we recommend hand-washing only, using warm soapy water.